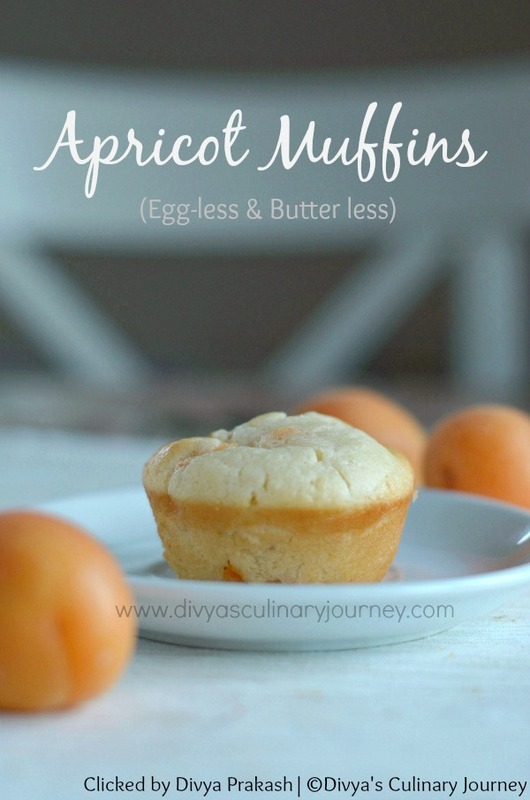 Today I am here with Apricot muffins recipe. We got some fresh apricots this week from the store and as they were tangy no one at home was ready to eat it. So decided to use it for baking and baked muffins using them. The muffins came out very soft and moist. 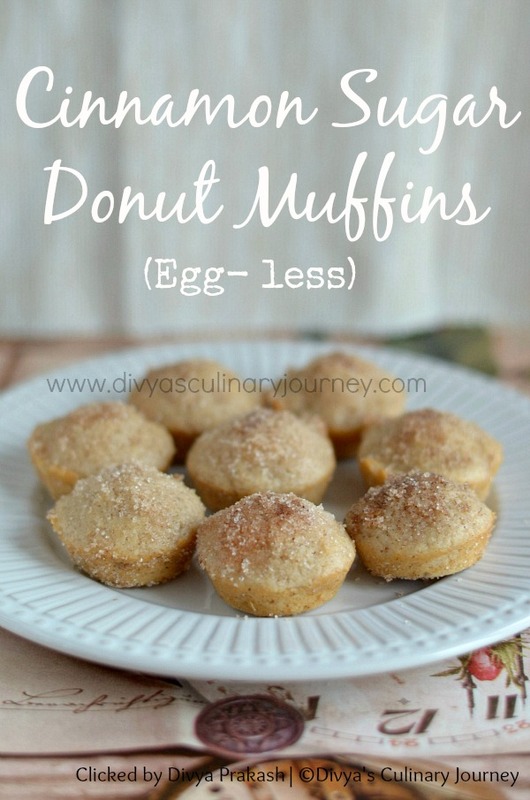 These are made without egg and butter. Today I am here with a healthy cookie recipe - Ragi honey cookies. I have been experimenting a lot with ragi flour lately and I made ragi kozhukattai for dinner last night. Though couldn't click a picture of it, while eating it, hubby suggested why don't I try ragi cookies next. I too liked the idea and today I tried these cookies and it came out really well. 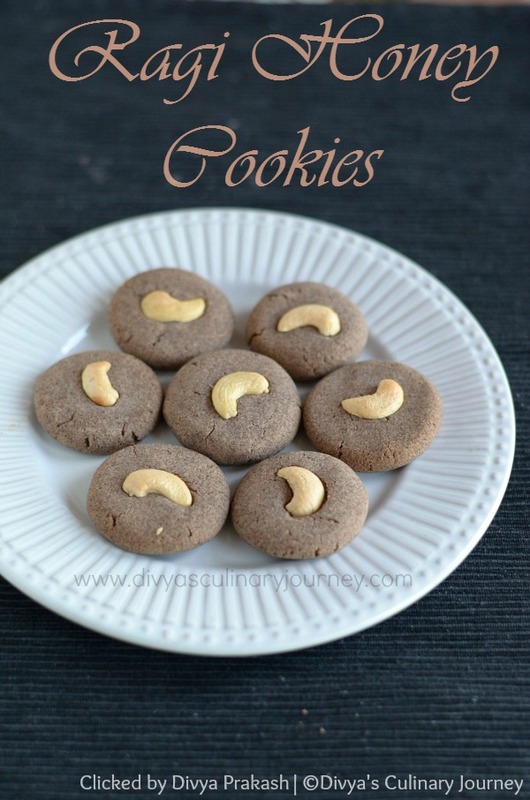 These cookies are very easy to make and are delicious as well as healthy compared to the regular cookies since finger millet flour is used and also instead of refined white sugar, honey is used for sweetening. My kids liked the cookies too. Oven roasted Almonds | Roasted Almonds in Oven | How to roast almonds in oven? After posting a lot of sweet bakes, today I am here with a healthy snack recipe - Roasted almonds. It is prepared in oven with simple ingredients. It is very easy to make and it is very quick to make too. 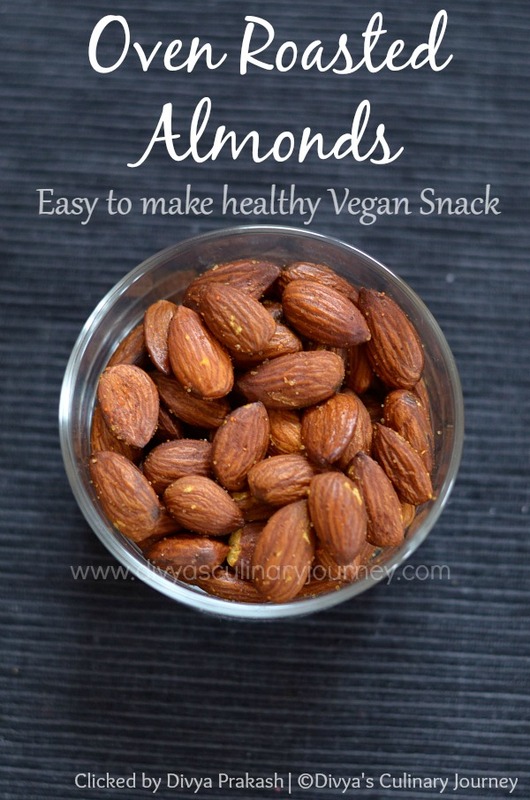 Just mix the almonds with the ingredients, roast it in oven and then enjoy this healthy and delicious snack. Today I am here with Cumin cookies recipe. These are cumin flavored salt cookies that are made in Indian bakery style. These cookies are easy to make and are egg free. The ingredients are mixed and the dough is rolled into a log and chilled for about 30 minutes and then the log is sliced and the slices are baked for about 15 minutes. When the cookies are cooled, they are ready. No other special technique is required for this cookie. They make a perfect combination for tea. Today I am here with another fruit cake recipe. 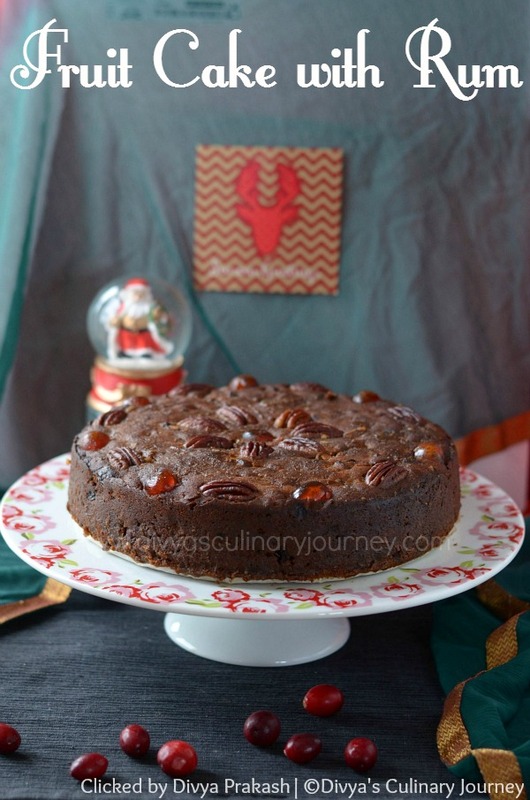 This fruit cake is made with rum soaked dry fruits. Then it is let to mature for another week by feeding it with rum. Resulting cake is moist and flavorful. This cake involves a little planning ahead unlike the other cakes. In India, usually around November end or December first week, a event called Cake mixing ceremony takes places in almost all star hotels where all the chefs and guests gather and mix dry fruits with liquor to let them soak till they are ready to baked into fruit cakes or puddings. The longer the fruit soaks the more flavorful it will be. I soaked the dry fruits for one month and then baked the cake and let it mature for another week by feeding/basting/ brushing it with rum once in two days. The cake matured by feeding with rum, lets the cake stay moist for a long time and increases the flavor of the cake. The shelf life is more for this kind of cake. They stay good for a really long time as alcohol acts as a preservative. Today I am here with Cinnamon sugar donut muffins. These are bite sized mini muffins, that resemble donut holes and are covered with cinnamon sugar. These muffins turned out delicious and quite addictive. One cannot stop with just one muffin and these vanished in very little time. My kids loved it. Next time when I bake these muffins, I am going to double the recipe. This is a easy to follow recipe with minimal effort required. So when you crave for something sweet this winter, why not try this cinnamon sugar donut muffins, which will be ready in few minutes. 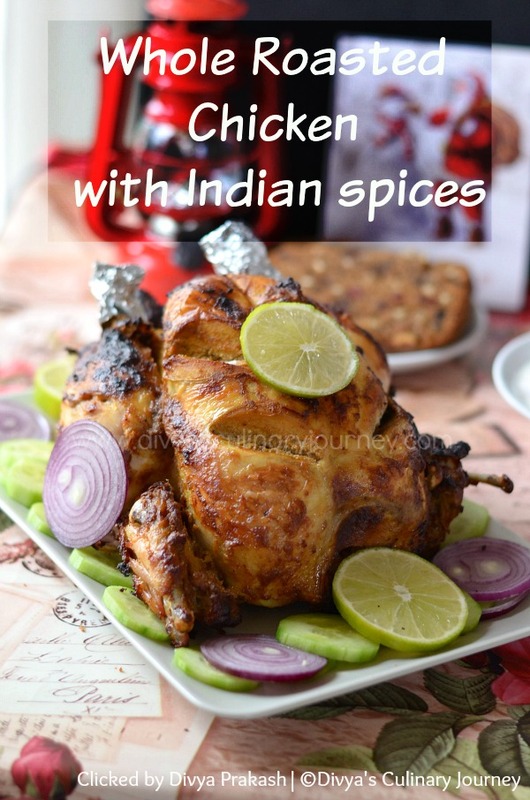 Today I am here with a recipe for perfect whole roasted chicken with Indian spices. We love chicken and my daughter has been demanding for whole roasted chicken for a long time. In fact her initial demand was whole turkey during Thanksgiving, but somehow she settled for whole chicken. Finally this weekend, Hubby got medium sized chicken from super market and I roasted it in oven and it came out perfect - juicy and tender. I just followed my own recipe for the marinade while for the cooking / roasting time followed the instructions given on the package (in which the chicken was packed). Never thought roasting a whole chicken would be this easy. Today I am here with Christmas Fruit Cake recipe made without egg and without alcohol. 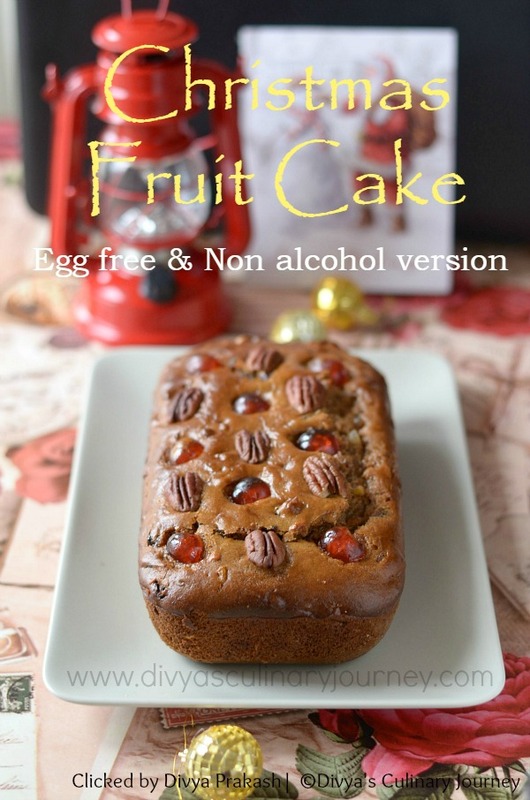 I have already posted a Fruit Cake recipe with Egg but without alcohol. This fruit cake is also called Plum cake back in India. This cake is loaded with dry fruits and nuts and the spices in the cake, makes it exotic. It is my favorite Cake. Though this cake is famous during the Christmas season, it is always available year round in the bakeries. I wanted to post the egg less version of the Christmas Fruit cake and experimented with so many recipes until I arrived at this recipe, which is easy and fool proof recipe for perfect Christmas fruit cake. I have used dark muscovado sugar in the recipe and hence I didn't have to make the caramel syrup for the fruit cake, which is the trickiest part for me. It would take atleast 2 attempts for me to get the caramel syrup right. With that part skipped, all other part is easy and the result is an aromatic, tastier fruit cake just like the one available in the bakeries. Today I am here with Snowball Cookies Recipe. This cookie has so many different names - Mexican wedding cookies, Russian tea cakes, Pecan butter balls, Pecan Cookie Balls etc., and many more. But whatever may be the name, it is a delicious melt in the mouth, shortbread cookie loaded with pecans and are rolled in powdered sugar. As it is covered by powdered sugar, it gives a look as if it is covered with snow, may be that is why it is called snowball cookies. It looks very attractive and also it is very easy to make. I wanted to bake these cookies for longtime and finally could bake it today. It came out very well and kids loved it very much. Today I am here with Red Velvet cupcakes with cream cheese frosting. These are red colored, soft velvety cakes with mild chocolate flavor. I love red velvet cakes and while living in US, I would bake them using box mix and have never tried making it from scratch. But it has been on my 'to bake' list for a longtime. Finally I baked these cupcakes today and it came out very well - so soft and velvety. 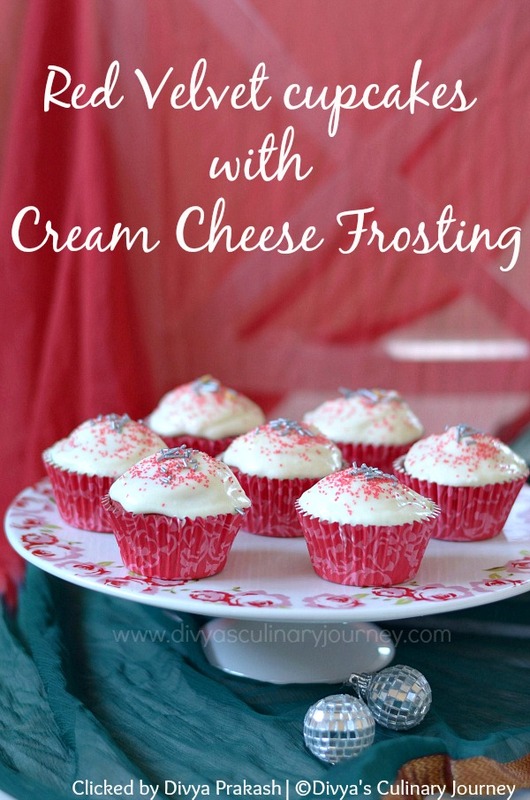 The frosting which is light, fluffy and not overly sweet, makes the cupcake even more delightful. Be it Christmas or Valentine's day, these cupcakes are perfect for both the occasions because of their beautiful red color. Who doesn't like cupcakes with beautiful color and flavor? Today I am here with Ginger Cake recipe. Usually ginger cake is made with molasses / treacle, golden syrup and brown sugar. But I have used honey and light brown sugar in this cake. So this is not the usual version of ginger cake. 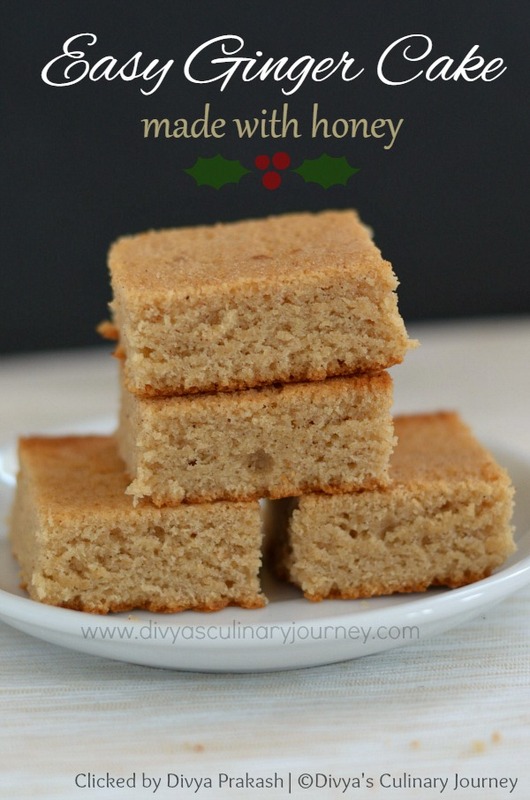 This cake has subtle flavor of ginger and other spices which makes it perfect for the holiday season. This cake is soft and moist and can be served as a snack cake with tea. So if you are looking for a ginger cake without molasses or corn syrup, then this is the cake for you. The warm spices in this cake makes it a perfect snack cake for this season. Today I am here with White Chocolate Chip cranberry cookies recipe. 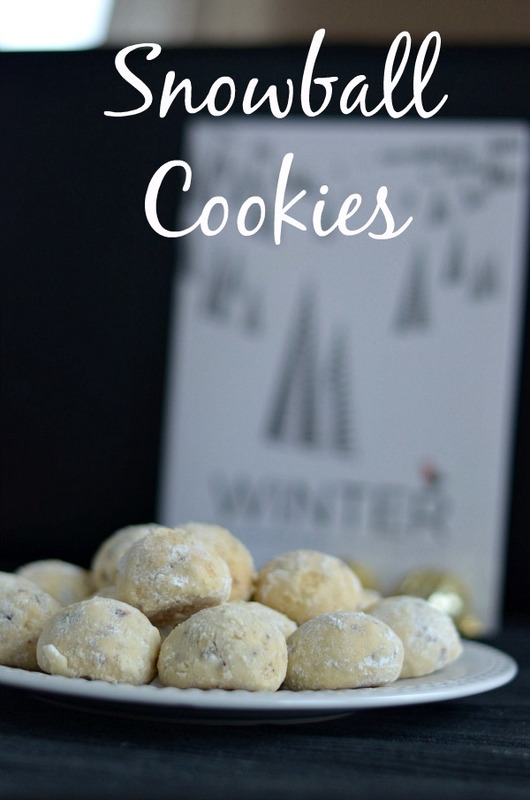 These are soft baked cookies with white chocolate chips and dried cranberries. Unlike the regular cookies, these cookies are soft and kind of chewy. 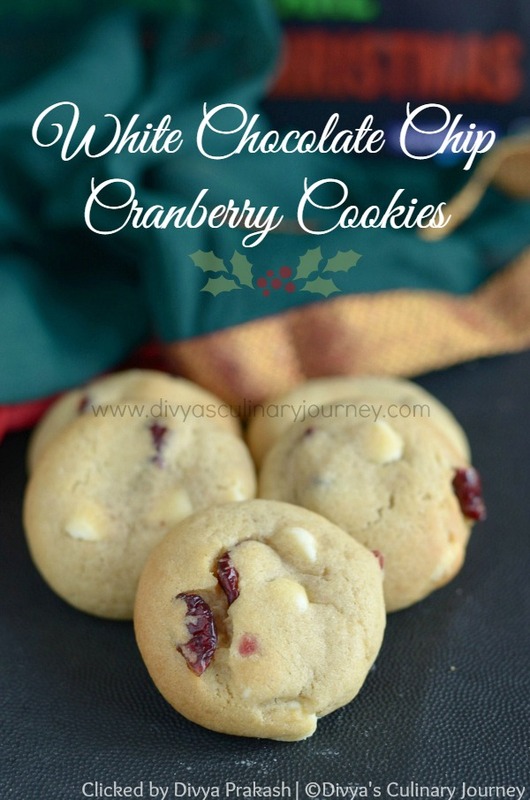 I like the combination of white chocolate and cranberries in this cookie - they make the cookies look Christmass'y. So this cookie is perfect for the holiday season. When I baked this cookie recently, I asked my kids to help me and they enjoyed doing it. Baking with kids is always fun and this made them so excited about the cookies. They couldn't wait till the cookies to come out of the oven and cool down. Some how I managed to keep them away till then and when the cookies are ready, they totally loved it. YUM is the word! I loved it too. This is the first recipe, I tried with my new hand mixer (kenwood kmix) that I got recently for Black Friday Sale. Ah!! I totally fell in love with it. Preparing a cookie dough was a breeze with that. Anyway all the stories aside, let us come to the recipe now. 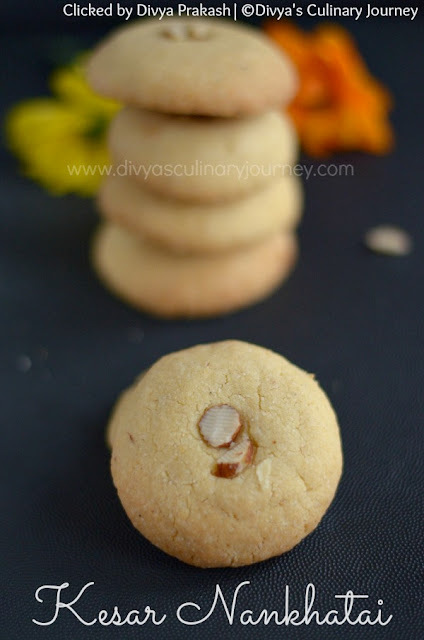 Today I am posting Kesar Nankhatai recipe here. These are saffron infused shortbread cookies. 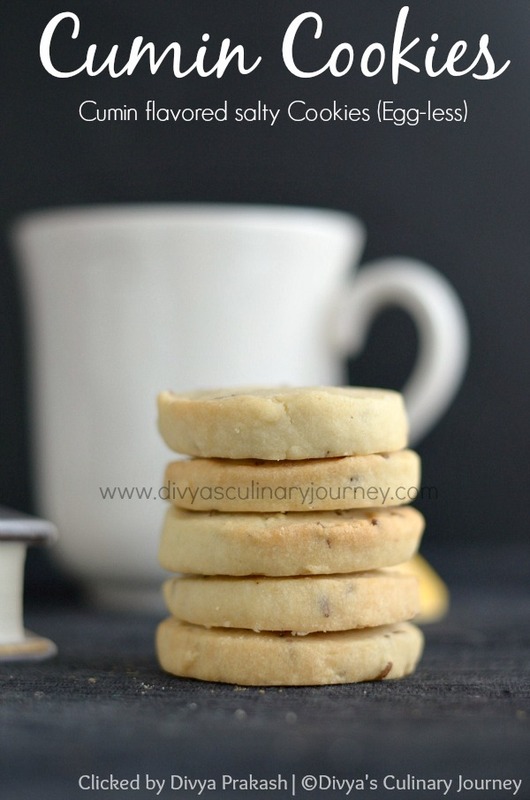 I love Nankhatai Cookies and have already posted its recipe here. This Diwali, I wanted to bake a variation of the usual nankhatai and came up with this recipe - Kesar Nankhatai. They were aromatic, crunchy and tasty cookies. These are egg free too. My kids loved it so much. Not only for Diwali, this cookies can be baked anytime during the year and can be great as edible gifts too. Why not bake these Egg free Indian inspired cookies for this holiday?